31st August 2013 - Brian McGowan had two grilse on Beltra at the Boathouse today, 6 and 4 pound. Lost another grilse in Walshes and released a fine sea trout of about 4 pound. 29th August 2013 - The Newport River has enjoyed some good sport over the past two weeks, with many fresh salmon caught. The week ending 18th August, there were 11 recorded with Martin McCoy, N. Ireland, landing three grilse ranging from 3 to 4 pounds, plus four sea trout between 0.75 and 1 pounds, all of which were returned. Nigel Berick, visiting from Holland also had great sport, with five grilse landed ranging in weight from 3 to 4.5 pounds while Barry Kenny, Co. Dublin, had three grilse of 3 pounds each and three sea trout. Over the past week, Richard Moore had good success with three salmon, one weighing 4 pounds the other two weighing 5 pounds and a few sea trout, while Tristan Moore had three sea trout, a 4 pound grilse and a nice 9 pound salmon also. David Nevin, had a 7 pound salmon and a sea trout of 1.5 pounds, with Graham Wright also enjoying the sport, with a 5 pound grilse and three sea trout totalling 4 pounds. Fishing out of Newport House, William Glenman returned a nice 10 pound salmon and also landed a sea trout of 1.5 pounds, while local angler Martin Hughes had two grilse of 4.5 and 5 pounds. Not too many anglers have fished the lake of late however; it should be in good condition for sea trout at the moment. Fishing over the weekend David Patton had two fresh sea trout and rose several others while Alan Patton had a 4 pound grilse at the Bouy earlier in the week. 25th August 2013 - A good number of fresh grilse caught on the Newport river this week. Very few anglers fishing the lake. Best day 8 fish. 22nd August 2013 - Alan Patton had a 4 pound grilse at the the Bouy this evening. 14th August 2013 - Anglers are reporting some very good sea trout fishing this week. 27th July 2013 - Scores of sea trout and some salmon spotted going over the falls on the Newport river yesterday. 25th June 2013 - Daniela Radu from Washington DC on her first visit to the lake landed a 9 pound fish at the Quarry this evening on a Jaffa. 22nd June 2013 - Ivor Prichard fishing with Larry McAlinden had a 10 pounder at Morrissons. Frank Dooley also had an 11 pound salmon this evening. Work has started on our new Marina. 15th June 2013 - Martin McCoy had a 10 pound salmon at the Boathouse and Dave Malpas had a 4 pound grilse in front of the Boathouse on an Octopus. They also rose four others. 14th June 2013 - James Burns had a 6 pound fresh salmon at Morrissons and turned seven others. 13th June 2013 - Peadar Jennings had a fresh 5 pound fish at the Boathouse. 7th June 2013 - Michael Graffe from Switzerland had an 8 pound salmon today at the Stakes. Eamon Kennedy had an 11.5 pound fish on a Green Peter at Tommys Wall, very fresh. Jackie Deffleys 11 pound salmon, Rocky Moran driving the boat. 31st May 2013 - Ian Conn had three salmon today on the road shore - 6, 8 and 9 pound. Eamon Kennedy had a 10 pound fish at Flanagans bridge, which he returned. They rose 12 more salmon and lost 2. James Byrnes had a 6 pound salmon at the Dock, he rose 17 other salmon! Fresh run of fish into the lake since yesterday. 30th May 2013 - Ben Baynes had two salmon yesterday evening at Morrissons and Fahys - 6 and 8 pounds, both fresh on a Lord Lewis. 28th May 2013 - Derek Killian had an 8 pound salmon at the Quarry today. 27th May 2013 - Derek Killian 5 pound salmon at the Quarry. Jackie Deffley 7 pound at Morrissons, he also had a 7 pound salmon at the mouth of the Glenisland river yesterday. Chris Bucknell had a 7 pound salmon at the Boathouse on a Green Peter. 25th May 2013 - Charles Murray 8 pound at Flanagans Bridge. Martin Dolan 9 pound at Flanagans Bridge. Michael Dolan two salmon of 5 pound, one released, both at the Buoy and turned two others. Sean Dolan lost a fish and turned another. 23rd May 2013 - Another great day on Beltra. 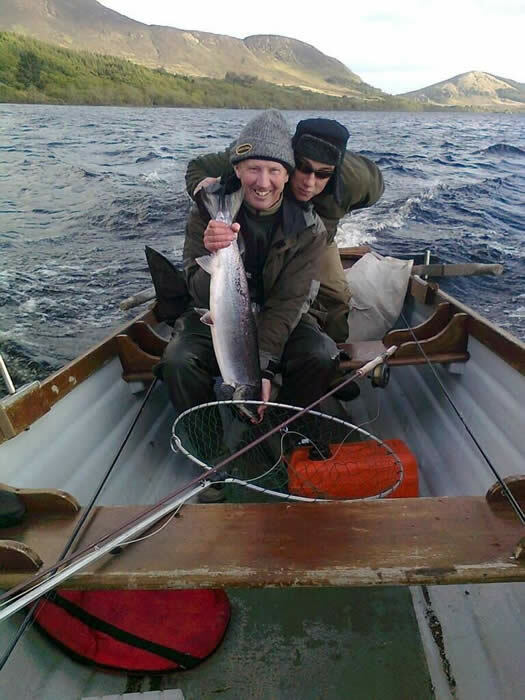 Larry McAlinden 12 pound salmon at the Dock on a Dunkeld, dead fresh with sea lice. Frank Dooley 9 pound and Declan Dooley 8 pound, both fish were fresh. Jackie Deffley 11 pound fresh fish at the Dock. Manfued Bunzel 8 pound at Morrissons. Ben Baynes lost a fish. Many more salmon turned. There were also 3 salmon off the Newport river - 5, 8 and 11 pound. 22nd May 2013 - Andy Bowman 9 pound at the Buoy. Ian Dunderbell 7 pound at Fahys. James Burns 8.5 pound at Flanagans bridge and 10.5 pound at the dock which was returned. Tony Murtagh 8 pound and 13 pound on the Newport river. Eamon Kennedy lost two fish on the lake. 20th May 2013 - Ben Baynes had two salmon at Morrissons today, 7 and 11 pound on a Claret Bumble. Bothfish were fresh. Matt Higgins lost a fish. 19th May 2013 - Charles Murray had an 8 pound salmon at Morrissons today. Sean Dolan lost a salmon at Fahys. Plenty of salmon showing along the road shore. Please note that all anglers must report their daily catch. We know there were at lease two fish caught on Friday that were not reported. 18th May 2013 - Great day on Beltra today. 6 salmon that we know of. Manfued Bunzel 6 pound at Morrissons, Richard McDowell 11 pound at the Quarry. Jonathan Murray 7 and 8 pound at Fahys, Sean Dolan 7 pound at Fahys and and Michael Dolan 9.5 pound also at Fahys. 17th May 2013 - Two fish that we know of caught today. One fish landed at Fahys... looking good for the weekend. 15th May 2013 - Dave Patton landed a 9 pound salmon at the quarry this evening. 14th May 2013 - Michael Dolan landed an 11 pound salmon off Clarkes point today. Paddy Kelly lost a fish at the Quarry and there were 2 fish lost on the Newport river. 13th May 2013 - Michael Dolan had a 9 pound fish at Clarkes point today. Four salmon off the Newport river and 3 lost over the last few days. 11th May 2013 - Today is the last day of catch and release on Lough Beltra. From tomorrow the Co-op would appreciate if anglers only kept one salmon per day. 8th May 2013 - Vincent Rigney landed an 8 pound salmon at Morrisson's today. Tom Vesey had two salmon, 9 and 12 pound, at the Forestry and Fahys point. Just a quick reminder regarding membership for those that have yet to renew, you can pay online from our website. Picture below of Gearoid Muldowneys fantastic 17 pounder! 5th May 2013 - Another fantastic day on Beltra. Declan Dooley had two salmon at Morrissons, 6 and 12 pound. David Nevin had a 10 pound fish at the Dock and, wait for it!, Gearoid Muldowney with a 17 pound salmon at the Quarry. Congratulations to our Secretary Michael Cunningham who got engaged over the weekend. 3rd May 2013 - Another 2 fish off the Co-op side today. Dave Patton had a 9 pound salmon at the Yellow House. Rocky Moran had another fish today weighing in at 10 pound. Yesterdays unidentified angler who landed the 9 pound salmon at the boathouse was Dr. Charles Scott-Knox-Gore. 2nd May 2013 - Red letter day on Beltra.... 6 salmon that we know of. Ben Baynes 8 pound, Rocky Moran 12 pound, Pat Burns 9 pound, Danny McAllister 11 pound, Jackie Deffley 8 pound and one other fish landed. We are awaiting confirmation of the name of the lucky angler. All fish were caught on the Co-op side of the lake. With more rain forecast tomorrow the prospects for the bank holiday weekend are excellent. 28th April 2013 - Dave Malpas had a 9 pound salmon at the dock today and Mel Parrott had a 7 pound salmon at the quarry yesterday. Good run of fish into the lake this past few days. 26th April 2013 - Martin McCoy was lucky over the last day or so. He landed a 9 pound salmon Wednesday on a Green Peter and a 12 pound fish today on a Claret Bumble. Well done Martin. 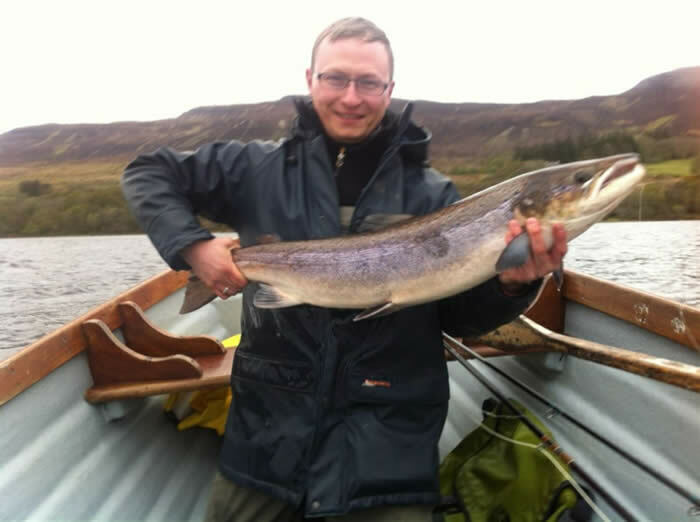 22nd April 2013 - Dave Patton had an 11 pound salmon at the mouth of the Glenisland river. the lake has been rising all day due to overnight rain. 21st April 2013 - Mel Parrott landed an 8 pound salmon at Morrissons today and a visiting Donegal angler landed a 7 pound salmon at Clarkes point. Dave Patton also had an 11 pound salmon at the mouth of the Glenisland river. The lake has been rising all day due to heavy overnight rain. 20th April 2013 - Ronnie Mayock had an 8 pound salmon at Morrissons today. 18th April 2013 - Brian Hope landed a very fresh 8 pound salmon at the Strand this evening. Good water in the Newport river this week has seen a good run of fish into the lake. "We had some good sport last week fishing out of Newport House with Eamon Kennedy. A good number of kelts were caught along with 5 springers and surprisingly a 15lb or so Baggot/Rawner.The fish was in full spawning colours much to everybody's surprise." Picture below shows the best springer, estimated at about 13lb. Successful fly was the Beltra Badger. Eamon's "Jaffa" was also successful along with the Clan Chief. 15th April 2013 - Jackie Deffley landed a 10 pound springer at the corner of Walshes yesterday evening. You can now follow us on Twitter also @ loughbeltra. 13th April 2013 - Beltra West - Thursday two fish 6 and 7 pound. Friday - 3 fish 12, 11 and 6 pound. Beltra East -David Eddis had one fish of 11 pound at the Strand and rose 3 others. How about that! 31st March 2013 - First salmon off Beltra..... James Dolan landed a 7 pound sea-liced fish on a shrimp fly at Tommys wall today. Well done James! 18th February 2013 - A quick reminder to all our members regarding our AGM next Friday night (22nd) at 8pm. Guest speaker will be Niall Greene from Salmon Watch Ireland. Free draw on the night for all paid up members, prizes include a day on the Ridge Pool, Galway Weir, Delphi and many more! Remember you can pay your annual membership online, to do so please click here. Many thanks to all of our members who have very generously made donations to our Stream Enhancement Fund. This will help us get vital blockages cleared on our streams in 2013. 8th February 2013 - Our online payment functionality has gone live today. Anglers can now pay their membership as well as book boats, engines and fishing online. The website implements Paypal functionality which delivers state of the art encryption technology which ensures all payment details remain confidential and unaccessible. We would encourage all anglers to use the new online payment processing as much as possible as it significantly decreases the administration overhead for the Co-op. We are also keen to get feedback on your experience paying online. If you have any recommendations on how we could improve the process please feel free to make suggestions to any of our committee members. 6th February 2013 - All members should have received our AGM notice and membership application in the post. Please note we are having a free draw for all paid up members at the AGM on February 22nd. Prizes include fishing at Delphi for 2 people, a day on the Ridge Pool, free membership on Lough Beltra for 2014 and 2 rods on the Galway weir. The guest speaker at this years AGM will be Niall Greene from Salmon Watch Ireland. 4th February 2013 - Glenisland Co-op has recently been approved grant aid by Leader for a new marina at the boathouse end of the lake. This will put an end to boats being damaged during flooding. The overall cost will be c. 120k of which the Co-op must raise 25%. All donations towards this project would be greatly appreciated. We are also replacing the wall at the dock end of the lake for health and safety reasons. CCTV will be in operation at this end of the lake, in addition to the boathouse, from the opening day of the season. 2nd February 2013 - The 2013 fishing season will commence on Lough Beltra on Wednesday 20th March. Applications for membership to the Glenisland_Co-op are now being taken. If you would like to fish the West side of Beltra then please contact Newport House.